Like Google, Twitter allows you to search for content that interests you. It may sound weird that Twitter is beating Google in real-time search, but a little reflection shows that there’s some sense behind it. After all, there’s a difference between the real-time search of Twitter and the carefully vetted and indexed information Google provides. Like all information, faster is not always better or more accurate — you have to evaluate your sources. If you’re feeling lucky though, it’s easy to find what you’re looking for in the cacophony of Twitter. 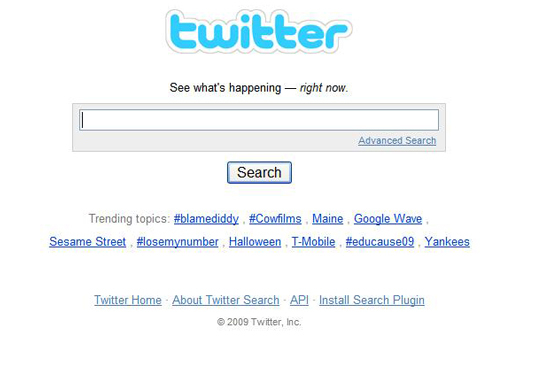 The easiest way is to navigate over to Twitter’s search page and type what you’re looking for. You’ll see a few trendy topics on the page, but you can search for whatever you want. Click the Advanced Search link to see some familiar options (like exact words and phrases, dates, and specific people) and some more interesting choices (like location or use of positive or negative emoticons). A key feature you should get to know is the hashtag. By putting a pound sign (#) before certain keywords, Twitter users make it easier to link their posts with the others discussing the same topic. Find a common hashtag for the subject you’re interested in, and you’re ready to go. Always consider your source when you’re searching for information, but you can now use Twitter and Google in conjunction to get whatever information you need.